Andy Fist here – I’m the co-founder of KOOEE! and the manager of our little jerky factory in Legana, Tasmania. This morning I got to meet Malcolm Turnbull, the Prime Minister of Australia. I have always wondered how these little opportunities arise, so thought it might be fun to share a few details of how it all unfolded. Some background: KOOEE! has been well supported by the Local, State, and Federal Government. A year ago we announced that the Federal Government matched a $163,750 investment to help set up our jerky factory in Legana, Tasmania (AGIIF funding). One of our operational staff, Dean Hughes, is also completing his Certificate IV in Food Processing with some funding from the Industry Skills Fund. 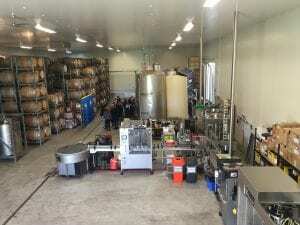 On a state level, we’ve done very well through our Brand Tasmania partnership, and locally the West Tamar Council has been very helpful giving feedback on our packaging and site compliance (and plenty of encouragement). It was from the office of Andrew Nikolic, Federal MP for Bass. His staff members invited me to a small meeting with Andrew Nikolic and Federal Trade Minister Steven Ciobo the following morning. 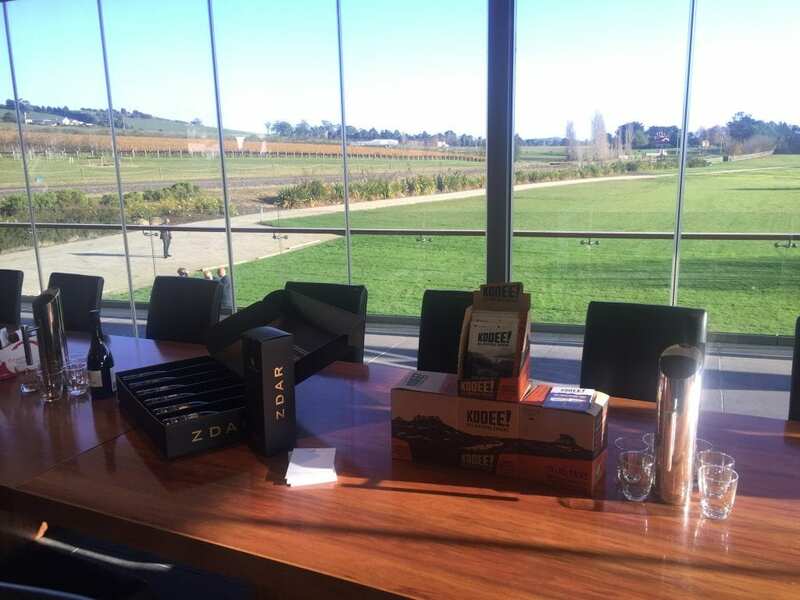 I enthusiastically agreed, and was asked to arrive at the Josef Chromy Vineyard at 9.15am. I shared the news with my colleagues at the factory, and we mused that sooner or later Malcolm Turnbull and Bill Shorten should be visiting Tasmania, as the local seats are quite marginal. Obviously not this time though, right? Wrong. At 7.30am I got another phone call telling me that – on the down low – Malcolm Turnbull, the Prime Minster of Australia, would be in attendance at the meeting. How exciting! The PM! The most important politician in the land, and a possible future customer of KOOEE! Game on. I immediately ironed my “country boy done good” shirt (it’s blue checked), put on my suit, and drove to the Vineyard. The vineyard looked sparse – the last yellowing leaves of the 2016 vintage were falling from a single plot of sauvignon blanc. Upon arrival I was asked to sign a media release, and was given a name tag “Andy Fist” to stick to my suit. I then attempted to carry all of my product samples 150m to the winery. I dropped a few items along the way, but fortunately a local journalist, Manika, was there to help out. There were plenty of familiar faces when we arrived, including Andrew Nikolic, Eric Hutchinson, and Tasmanian Premier Will Hodgman. I was told that there were a few people from the food and wine industry waiting upstairs. I began to relax slightly. Then, the national media began to arrive. First came the national media. 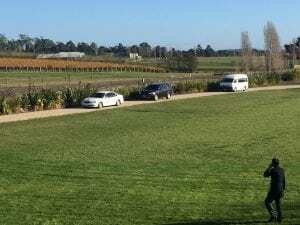 A long stream of people filed down the long path to the Josef Chromy Vineyard, and before long there were dozens and dozens of people waiting for the Prime Minister to appear. They didn’t have to wait long, as 3 cars soon appeared, and rolled slowly towards the waiting media scrum. The car door was opened, and the PM was immediately exposed to the waiting media. 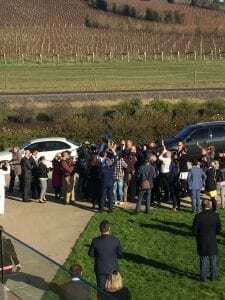 He greeted all the people waiting for him, and slowly made his way towards the media to the winery. We were immediately told to stop taking pictures from the balcony, and to get inside. As I sat waiting inside I realised that my nametag had fallen off. At first I didn’t worry about it. Then, I thought of how I would feel being called the wrong name on National TV. Eric Hutchinson’s staff helped out, and an “Andy” nametag was soon reattached to the “country boy done good” shirt. Soon the politicians entered the room, and introductions were made. Malcolm Turnball then spoke to each person individually infront of a rolling camera. The minutes rolled by. 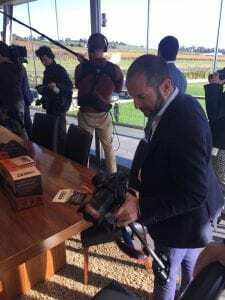 The photographer standing next to me slowly realised that he was in close proximity to some premium Tasmanian beef jerky. He looked at me, and I nodded – “Try it”, I said quietly. He ate a bag of jerky for breakfast with the PM just metres away, and his positive feedback was just what I needed before the attention turned, ever so briefly, to me. Andrew Nikolic walked over, smiled, and took a packet of KOOEE! from the display – “Are you ready Andy?” he said quietly. I nodded. He then held a packet of KOOEE! 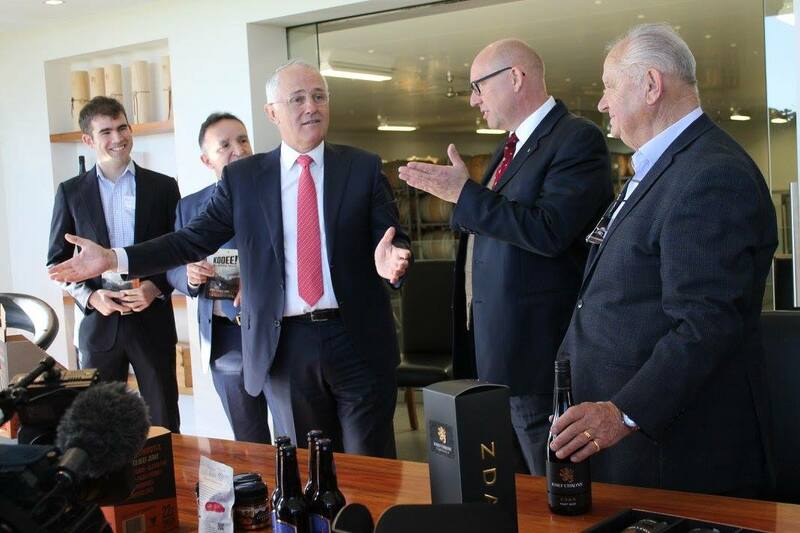 to the camera and spoke “Mr Prime Minister, this is Australia’s best beef jerky”. A few people laughed. Malcolm Turnbull walked over, and began a minute-long conversation with me. Much to my surprise, he already knew a bit about me and the history of KOOEE! He asked a few questions about our growth plans, and we had an informal chat about the products suitability for export markets. My only regret is forgetting to tell him that he can buy the product online and that we happily ship to Canberra. Next time. And that was that. Things are busy at our factory, so I soon drove out to our factory in Legana. Now it’s 4pm, and as the nightly news approaches I can’t help but wonder if I possibly said anything regrettable that could end up on the telly. Time will tell (we’ll try to get footage for the blog). As far as I’m aware we didn’t get much airplay on the news. In hindsight this was to be expected, as the PM shaking hands with a me just isn’t that newsworthy. 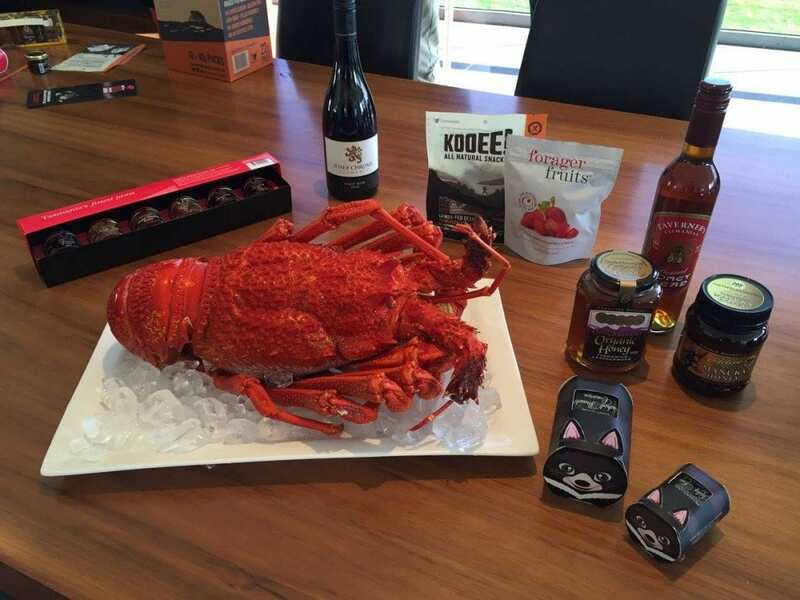 We’re also still waiting to get a very large order from the PM&C office in Canberra, but we at least have comfort that our local MP is a customer! It was a very exciting morning, but by the time I published the above blog post my computer had crashed and the KOOEE! vehicle had a flat battery. Returning to the realities of getting a small business off the ground was a hard landing, but we’ve very grateful at KOOEE! to have so much support from the government and the broader community.